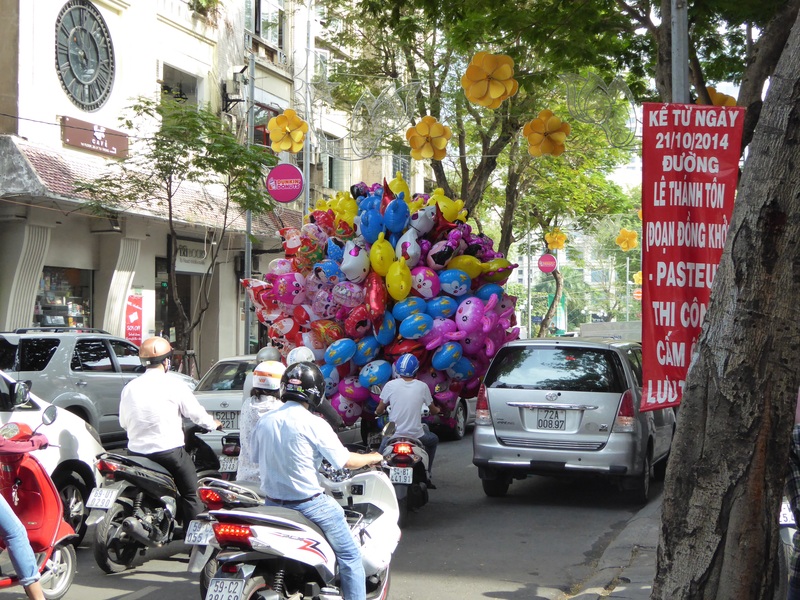 The Vietnamese drive on the right, or the left, or on the sidewalk. In fact pretty much anywhere the mood takes them. Never stop, hesitate or deviate from your chosen path under any circumstances – it will totally confuse people and add to the chaos. Sounding of horns means “I am coming through regardless”. It is also done because, well, just because they like sounding their horns. If you see a bus or truck coming towards you run like hell – they WILL run you down! Sidewalks are for parking motorbikes. Pedestrians should walk in the street with the rest of the traffic. Common-sense would dictate that you walk on the road facing the traffic? WRONG! 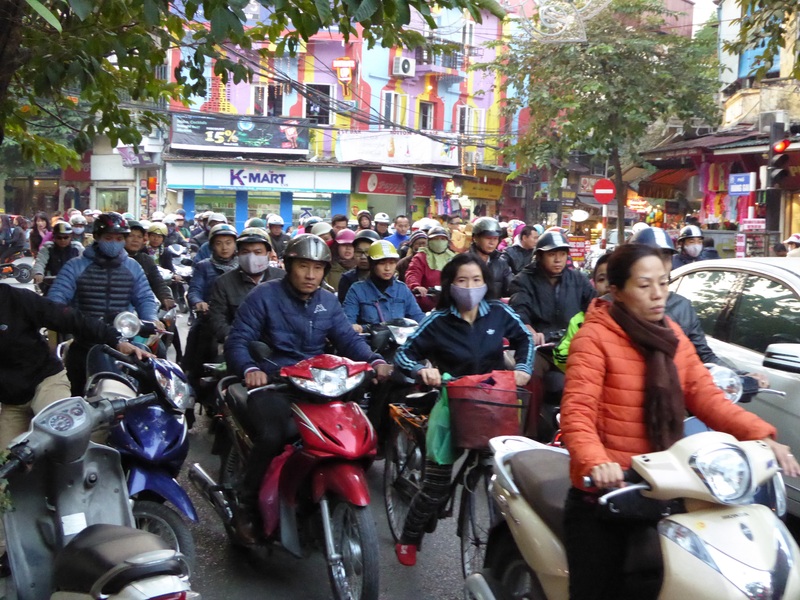 The Vietnamese way is to walk on the same side as the flow of traffic. Probably so you cannot see what is about to hit you. i.e. fewer witnesses! Texting or smoking whilst riding a motorbike and carrying is compulsory. When turning at a crossroads bikes will simply cut the corner on the wrong side of the road or pavement. Obviously, this is the safest way as it cuts down the distance travelled. Driving or riding on the wrong side of the road is perfectly acceptable if you are only going a short distance (say less than 400m) or are in a hurry, or there is a lot of traffic on the correct side of the road. Keep calm. As a foreigner, if you get hit, don’t get angry. It is entirely your fault. If you had stayed in your own country, there would not have been an accident. Pretty much sums it up really…. 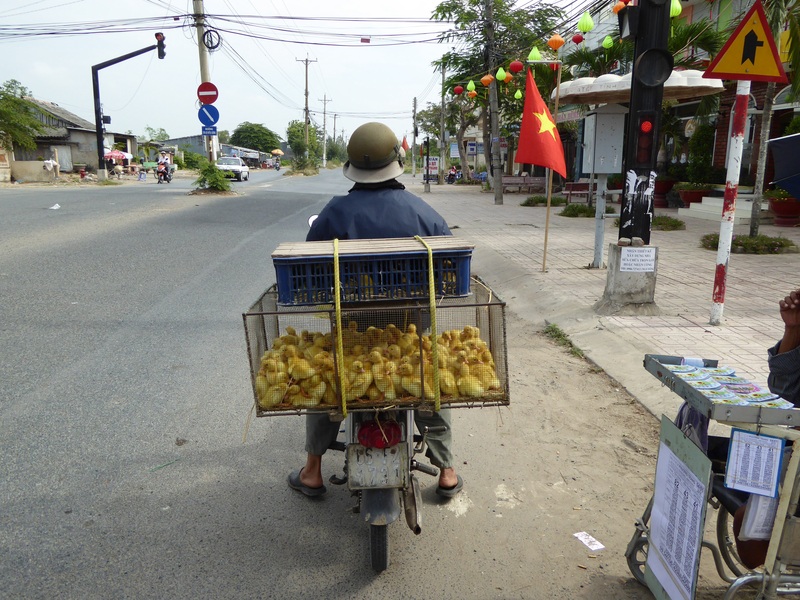 Quieter roads In the Mekong Delta. But chicks still need transport. I got quite a chuckle from your traffic perception. You might want to add that these tips are your opinion. Tip 3. Look in general direction but never make eye contact as they will take it as they are seen giving them the right of way. Nice looking blog.